Montoursville was incorporated as a borough in 1850 and was named after diplomat and interpreter Madame Montour, whose 1700s village of Otstonwakin, along Loyalsock Creek, was a strategic location in the early history and settlement of Lycoming County. 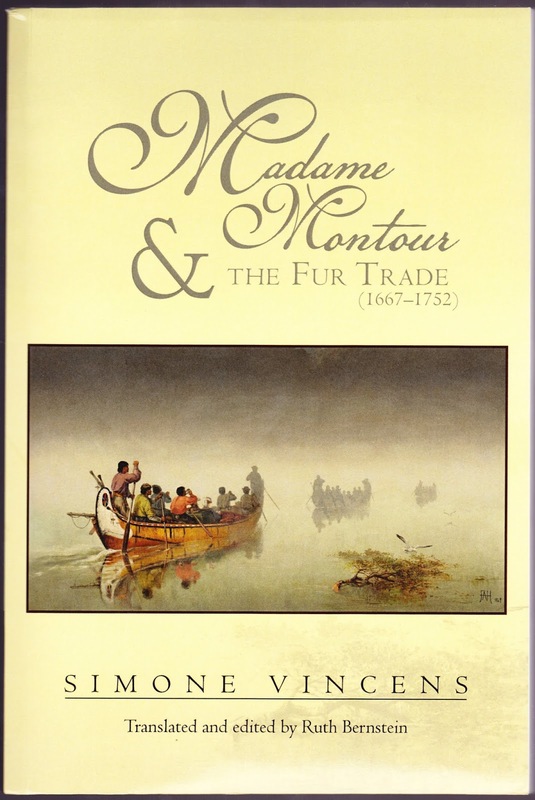 The borough sits on the east bank of the creek, a few miles east of Williamsport and not far from the original site of Madame Montour's Otstonwakin. Thus it is considered the successor of that historic village. 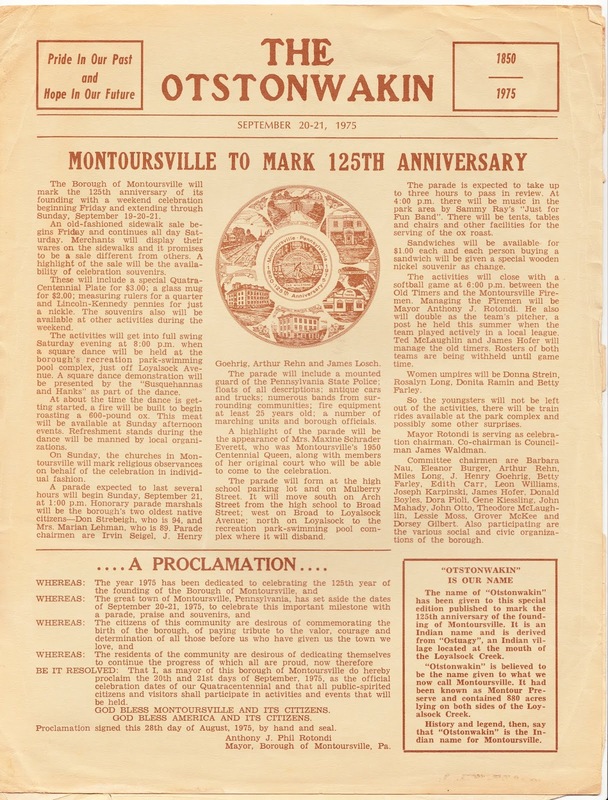 When Montoursville marked the 125th anniversary of its incorporation in 1975 the Otstonwakin heritage was woven deeply into the festivities. Shown at the top of this post is the sepia-toned publication titled The Otstonwakin, a six-page newsletter that provided some borough history and details of the celebration, which was held September 19-21, 1975. "Mayor [Anthony J. Phil] Rotondi is serving as celebration chairman. Co-chairman is Councilman James Waldman. Committee chairmen are Barbara Nau, Eleanor Burger, Arthur Rehn, Miles Long, J. Henry Goehrig, Betty Farley, Edith Carr, Leon Williams, Joseph Karpinski, James Hofer, Donald Boyles, Dora Pioli, Gene Kiessling, John Mahady, John Otto, Theodore McLaughlin, Lessie Moss, Grover McKee and Dorsey Gilbert." "The automobile dominates as the primary mode of transportation for borough residents as 83.8 per cent of workers from Montoursville travel to work by car. Three per cent use buses while 9.3 per cent walk." "Montoursville has had a number of newspapers over the years — none has survived." Those vanished periodicals, as of 1975, include The Pastoral Visitor, The Echo, The Globe, the Montoursville News, the Montoursville Monitor and the Montoursville Merchandiser. "Montoursville Borough opened its official office for business purposes in November, 1956, at 345 Broad Street. It occupied one room in the Cooper Building which was razed and is now the site of the Rosencrans Bakery." "Some of the major industrial land uses are on tracts of land owned or leased by GTE Sylvania Inc.; Conchemco Inc.; Schnadig Corp.; Marathon Carey-McFall Co. and Allegheny Fabrics Corp."
There are also facts about the school system, library and swimming pool. I'll plug those into some of the upcoming posts in this series. 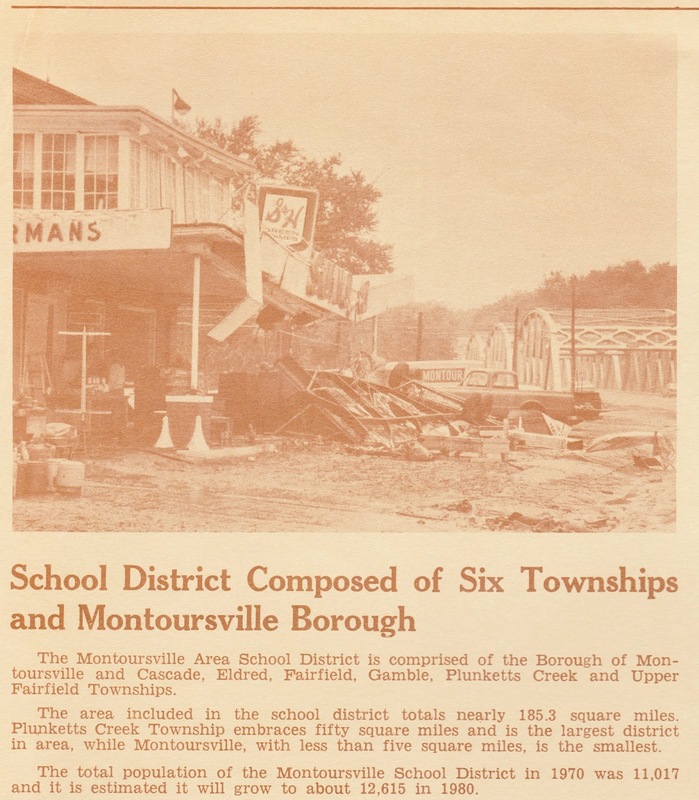 Final note: Perhaps the best place to turn for a past-to-present overview of the borough is Don King's "History of Montoursville," which is available as a PDF on the school district's website. 1. Full disclosure: I had a square dance class and evening assembly when I attended C.E. McCall Middle School in the early 1980s. 2. Donald Strebeigh (November 5, 1881, to December 19, 1975) died three months after the celebration. 3. Led Zeppelin was on a concert hiatus that lasted from May 1975 to April 1977 and was thus unavailable. 4. Fun fact: "quasquicentennial" is the correct word for the marking of a 125th anniversary. The Oststonwakin newsletter uses the term "Quatra-Centennial." 5. I am totally going to track one of those down. Stay tuned.